The picture from the play is Gareth as Maingot holding an ice pack on his head. the photographer is Alan Winn and it is copyright the Northcott Theatre Company 2002. The man who sent me the CD, a Mr. Andy Sinclair, the Press and Public Relations Manager of the Northcott Theatre Exeter (switch board 01392 233999), said I could share the photo for fan publications so I take that to mean I can share it with friends. But he did ask that both the photographer and the theatre be credited when it was used. 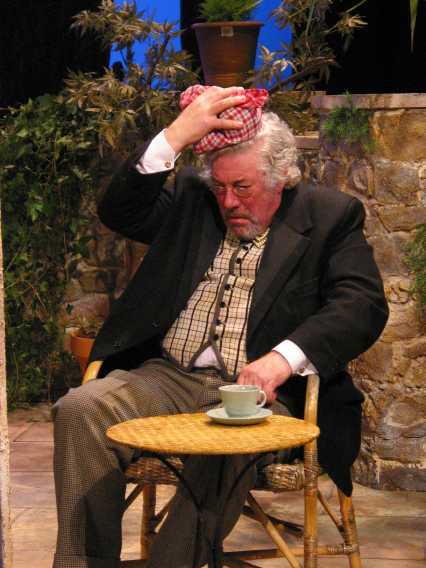 I am just going to go through the notices and reviews for FRENCH WITHOUT TEARS (Northcott Theatre in Exeter, Feb. 7-23, 2002) that I have and pull out the Gareth Thomas and pertinent bits. I would like to thank Andy Sinclair of Northcott Theatre for sending me the reviews. Also, I should mention that the photographer for the play is Alan Winn. For the reviews, sometimes I do not not have dates. And for one review, I don't have a source. Briefly put, Gareth Thomas plays Monsieur Maingot and his part is mainly in French since his character is a professor of French in this Terrace Rattigan comedy set in France in the 1930's. Online BBC (Devon page) mentioned mainly that Gareth Thomas was playing Monsieur Maingot and that he had last appeared at the Northcott as King Lear in 1989. Plus that he is still best known for being the hero of Blake's 7 which it called "Blake 7." Thomas told Newton about his role as Maingot: "Although I speak some French, I'm a little worried what will happen if I dry up. And he [Maingot] makes quite a few jokes in French too, so it will be interesting to see how the director will ensure the audience gets them." Express & Echo, Feb. 1, 2002, had an interview by David Marston. Thomas talked about Blake's 7 and the fans. He also mentioned he was the oldest member of the FWT cast by seventeen years. And that he had been acting before some of them were even born. Thomas said about the play, "It's a frothy piece and there's a very talented cast--although they are all much younger than me!" Express & Echo, Feb. 7, 2002, has another article by Marston in which he talks to the director Richard Baron who says this play is relevant despite being set in the 1930's. Express & Echo, Feb. 9, 2002, has a review by Marston. He enjoyed the play but didn't rave about it. He said, "The cast is pretty much spot on: very stylish and when the script allows it, frothy and light." About Thomas specifically, he only mentions that Edward Lipscome has designed a nice set and "...some memorable costumes--particularly a remarkable kilt that Gareth Thomas wears for a fancy dress night...."
Western Morning News, Feb. 12, 2002, has a review by Anne Broom. She loved the play. All she says about Thomas is, "Gareth Thomas is their spendidly larger than life and irascible tutor Monsieur Maingot...."
Herald Express, Feb 13, 2002, had a review by John Clamp. He loved the play. He said, "This show is likely to break records at the Northcott, and deserves to." He praised Thomas by saying, "...Gareth Thomas as Maingot proved himself a master of character." I have an unnamed newspaper review. Is there a paper called The Leader?? It is dated Feb. 14, 2002, and the review is by Jane Copeland. There is a photo of the romantic leads and a photo of Thomas with the caption: "Heads up: Monsieur Maingot nurses his bad head after the Bastille Day party." Thomas is holding an ice pack on his head. Jane Copeland loved the play and said, "The cast are terrific...." All she says about Thomas is that he played the French teacher who was "the larger-than-life Monsieur Maingot, played by Gareth Thomas, of TV's Blake's Seven fame." The Journal, Feb. 14, 2002, has a review by Mary Evans. There is the same ice pack holding Maingot picture, but this is cropped to end at about the waist. She really liked the play, although she was a little put off by some OTT acting. She really liked Thomas. "I loved the batty Fench teacher Monsieur Maingot, very well played by Gareth Thomas, whose French was impressive." This same review by Mary Evans also appeared without photo in the Exmouth Herald, Feb. 15, 2002. The Herald Express, Feb. 7 and 15, 2002, mention FWT. On the 7th, it is called "a masterpiece of light comedy" and on the 15th, it is called a "ripping comedy" with "superb staging." Online The Theatre Reviews site that cover the UK has a review by Timothy Ramsden dated Feb. 20, 2002. Ramsden loved the play. He ended the review by saying, "No tears here, just huge grins on the faces of the audience." Specifically, all he said about Thomas was that Maingot was "played with charming Gallic pedantry by Gareth Thomas." The Stage, Feb. 21, 2002, had a review by Roger Malone. Malone loved the play and said, "Here is a champagne production positively sparkling with high jinks and effervescing with romantic intrigue." The cast he calls "excellent." Specifically about Thomas , he says, "Gareth Thomas is a slightly shambolic, suitably irascible Monsieur Maingot--obliged to cram French into the heads of British students whose minds are collectively elsewhere." Last updated on 25th of March 2002.